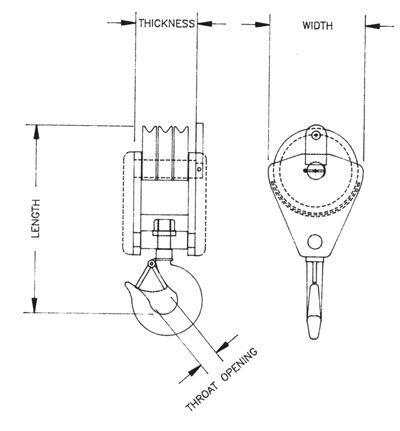 Large diameter alloy steel heat treated and ground center pins provide longer bearing life and low starting torque. Heavy duty cast steel sheaves with machined wire rope grooves. Furnished wit bronze or roller bearings and individual sheave lubrication permits adequate grease penetration. Detachable cast iron cheek plates for additional weight. Optional “H” models. Designed for shortest possible overall length for more head room. Moveable swivel hook provides easy engagement of hook by swinging backwal or forward. Enclosed sheave guard makes for easier threading—eliminates possibility of wire jumping sheave. Forged Steel Hook with heavy duty thrust bearing for 3600 rotation. Heavy steel plate welded construction provides rigidity and strength for longer life. Bronze Spacers between sheaves eliminate galling. 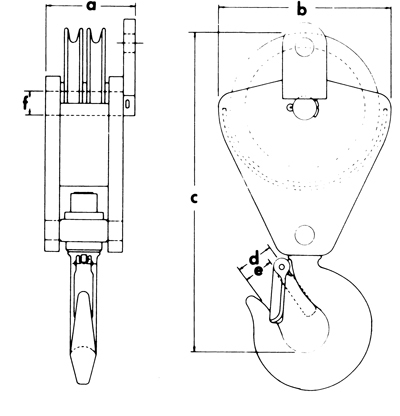 Standard hook latch with all blocks. Heavy duty cast steel sheaves with machined wire rope grooves. Furnished with bronze or roller bearings and individual sheave lubrication permits adequate grease penetration. 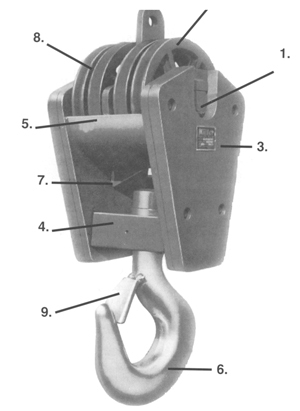 Moveable swivel hook provides easy engagement of hook by swinging backward or forward. Forged Steel Hook with heavy duty thrust bearing for 360° rotation.